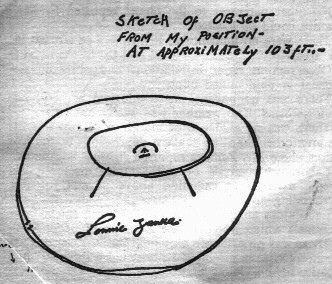 One of the most intriguing cases of a UFO sighting with physical trace evidence is that of the 1964 landing of an unknown craft witnessed by policeman Lonnie Zamora. This event has been one of the mainstays of Ufology for over 40 years, and is definitely one of those cases which will not go away. The Zamora incident began at 5:45 P.M. on April 24, 1964, in Socorro, New Mexico. Thirty-one year old policeman Lonnie Zamora was on patrol when he was passed by a car which was obviously speeding. Zamora took off in chase of the vehicle, but suddenly heard a loud roar in the distance, accompanied by a bluish, orange flame rising into the air. He knew that there was a dynamite shack not too distant from him, and he thought at first that there had been an explosion there. Abandoning the chase for the speeder, he pointed his police car in the direction of the shack. He radioed his activities to the sheriff's dispatcher. As Zamora proceeded towards the rising smoke and flame, the aftermath of the explosion seemed to disappear and reappear because of the rising and dipping roads he traveled. The route he was on was a narrow gravel one and it wound around a small gully. As he approached the location of the shack, he noticed in the distance a shining object, anywhere from 100 to 200 yards away. His first reaction to this sight was that it was an automobile which had overturned, and its gas tank had exploded. Upon a closer look, however, he discovered that it was an oval-shaped object without windows or doors. He stated that the object was about the same bulk of a medium-sized car. He was drawn to an unusual red insignia on the side of the object, and then noticed two beings that he thought at first to be children, dressed in white overalls. He recalled that one of the "children" seemed to jump (become frightened), upon noticing him. Regaining his composure, Zamora immediately radioed the sheriff's office the details of the incident. He decided to get a closer look at the strange scene before him. He then heard a loud roar, and saw a bluish flame shoot out of the underside of the object. Afraid that it was going to explode, he fell to the ground to protect himself. Next, he saw the object lift off the ground, and head southeast, flying in a straight line for about 10-15 miles. The legs that he had seen earlier had disappeared. Having intercepted Zamora's earlier radio transmission, State Police Sergeant Sam Chavez arrived at the scene just after the craft disappeared into the sky. The first military investigator on the scene, on April 25, was Army Captain Richard T. Holder, Up-Range Commander of White Sands Proving Grounds, along with an FBI agent, D. Arthur Byrnes, Jr., from the Albuquerque office. Major William Connor from Kirtland AFB and Sgt. David Moody, who was in the area on TDY, investigated for Air Force Project Blue Book on April 26. Dr. J. Allen Hynek arrived on April 28. "Present when we arrived was Officer Zamora, Officer Melvin Katzlaff, [and] Bill Pyland, all of the Socorro Police Department, who assisted in making the measurements. When we had completed examination of the area, Mr. Byrnes, Officer Zamora, and I returned to the State Police Office [at] Socorro, then completed these reports. Upon arrival at the office location in the Socorro County Building, we were informed by Nep Lopez, Sheriff's Office radio operator, that approximately three reports had been called in by telephone of a blue flame of light in the area... the dispatcher indicated that the times were roughly similar..."
"Noise was a roar, not a blast. Not like a jet. Changed from high frequency to low frequency and then stopped. Roar lasted possibly 10 seconds was going towards it at that time on the rough gravel road... At same time as roar, saw flame. Flame was under the object. Object was starting to go straight up slowly up... Flame was light blue and at bottom was sort of orange color... Thought, from roar, it might blow up..."
When the roar stopped, he heard a whining sound going from high tone to low tone, which lasted about a second. "Then," he said, "there was complete silence... It appeared to go in [a] straight line and at same [constant] height, possibly 10 to 15 feet from ground, and it cleared the dynamite shack by about three feet... Object was traveling very fast. It seemed to rise up, and take off immediately across country." "A woman who is now a radiological chemist with the Public Health Service in Las Vegas was involved in some special analyses of materials collected at the Socorro site, and when she was there, the morning after [Apr. 25, 1964], she claims that there was a patch of melted and solidified sand right under the landing area. I have talked to her both by telephone and in person here in Tucson recently." She had analyzed plant fluids exuded from the scorched greasewood and mesquite plants, and told McDonald, "There were a few organic materials they couldn't identify," but most of the sample was just sap. "Shortly after she finished her work," she told him, "Air Force personnel came and took all her notes and materials and told her she wasn't to talk about it anymore." Analysis reports of physical evidence at the site have never been released to the public. Two additional witnesses, Paul Kies and Larry Kratzer of Dubuque, Iowa, submitted statements to Dr. Hynek on May 29, 1968. In May of 1978 Ralph C. DeGraw, an Iowa investigator, interviewed them. They were driving just southwest of Socorro at about 6:00 p.m. that day when they noticed something shiny and a cloud of smoke near the ground in the vicinity of the town. Later they heard a newscast about Zamora's sighting and the significance of what they had seen became apparent. Kratzer said he watched as "a round, saucer or egg-shaped object ascended vertically from the black smoke... After climbing vertically out of the smoke, the object leveled off and moved in a southwest direction." He said the object was silvery and had a row of apparent portholes across the side and a "red Z" marking toward one end. At the time he thought it might have been an experimental vertical-lift aircraft. Kies saw only a shiny spot and the smoke. An FBI report dated May 8, 1964, notes that Zamora has been personally known for about 5 years and is "well regarded as a sober, industrious, and conscientious officer and not given to fantasy." The report also confirms the scorched foliage and the imprints, noting that, "Each depression seemed to have been made by an object going into the earth at an angle from a center line [and each] pushed some earth to the far side." Two years after the sighting, Major Hector Quintanilla, Air Force Chief of Project Blue Book at the time of the sighting, confided to intelligence specialists in a classified CIA publication that the Socorro case remained "puzzling." With the help of many other agencies, he had conducted an exhaustive check of military activities looking for an explanation, but none could be found. As other officers and investigators arrived, they discovered deep landing marks and footprints on the ground. FBI and Air Force personnel soon joined local authorities in the investigation, and found bent and burned brush in several places surrounding the spot where the object had sat. Measurements taken by police verified that there were 4 indentations on the ground; the distance between them formed a quadrilateral whose diagonals intersected at exactly 90 degree angles. 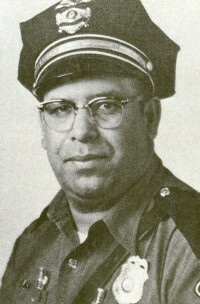 Zamora was known as a well-respected, reliable police officer with no hint of impropriety in his life, personal or professional. He described the event in detail to all who reviewed this case, including renowned UFO investigator J. Allen Hynek, who represented the Air Force at the time of Zamora's sighting. Immediately after the incident, he made a drawing of the insignia he saw on the side of the craft. Although the Air Force's Bluebook was notorious for either debunking or misrepresenting cases they looked into, I was surprised when I read the CIA evaluation of this incident as provided by the Freedom of Information act. The following document was made available for public inspection on January 2, 1981. It was originally included in the CIA publication, "Studies in Intelligence," released in 1966. The brief, "Policeman's Report," was written by Hector Quintanilla, Jr., the former head of Project Blue Book. "There is no doubt that Lonnie Zamora saw an object which left quite an impression on him. There is also no question about Zamora's reliability. He is a serious police officer, a pillar of his church, and a man well versed in recognizing airborne vehicles in his area. He is puzzled by what he saw, and frankly, so are we. "This is the best-documented case on record, and still we have been unable, in spite of thorough investigation, to find the vehicle or other stimulus that scared Zamora to the point of panic." The case received a great deal of press, and a lot of attention by UFO groups around the world. The one negative aspect of the Socorro incident, however, is that Zamora, though considered reliable by everyone who knew him, was the sole witness of the event. Naturally, any report is given more weight when multiple witnesses are involved. Zamora took such ridicule and kidding from members of the police force and local community, that he retired only two years after the incident. The Zamora case does not prove the existence of extraterrestrial life, but there is no doubt that some type of unusual craft with occupants did land, and take off again. Dr. J. Allen Hynek, who interviewed Zamora on more than one occasion, believes every word that Zamora said, however, offers no explanation for his sighting. In Hynek's own words; "There is much more evidence to indicate that we are dealing with a most real phenomenon of undetermined origin." If what Zamora saw was not of extraterrestrial origin, then where did it come from? Why did it land? Who were the strange occupants? For more details, see... Zamora's Project Bluebook report. 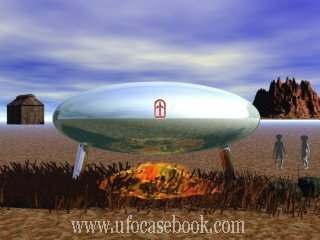 Another classic UFO landing case with very similar evidence involved one Maurice Masse, who, when shown a drawing of the Socorro object, remarked: "Someone else has seen my UFO."